A historic fire truck with local roots will be made new in coming years. Engine Four was first commissioned in Newberg, stationed in Dundee for nearly 50 years and returned to Newberg July 16 in preparation for restoration at a Tualatin Valley Fire & Rescue station in Wilsonville. "This beautiful rig has been a part of our fire department for quite a while now and we have enjoyed it and loved it. … We are proud to see it coming home to Newberg," Dundee Fire Chief John Stock said. 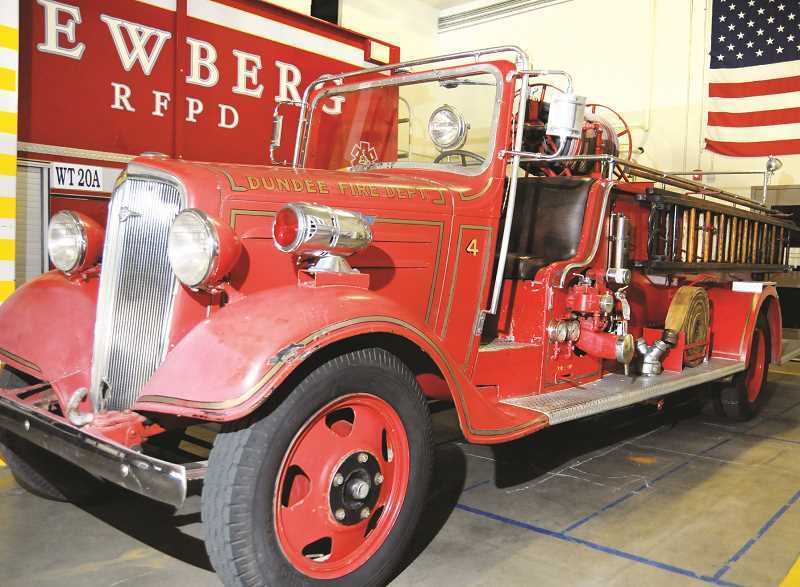 The Newberg Fire Department purchased the apparatus from Chevrolet in 1936, then sent it off to Seattle to have a hose bed and pump installed. At the time, the fire department served a population of 2,960 in Newberg. The truck stayed in Newberg until the 1960s, when it was sent to the Dundee Fire Department and remained in service there until the mid-1970s. The truck's duty was changed then to appear in parades and at the annual pancake breakfast and served as a backdrop for pictures with Santa. But now it's time for the truck to enter the next phase of its life. "There really wasn't a place to store the fire truck in Dundee for the best preservation of the vehicle," said Luke Nodine, a volunteer captain at Station 20 in Newberg who worked for 18 months to negotiate the rig's return to Newberg. "The truck was stored at the Dundee water treatment facility under a metal canopy, but it was under a tarp to save it as best as they could." The plan is to show off the truck at the Old Fashioned Festival's fire apparatus show at Renne Field on July 29 and then prepare it for restoration. "I've been working with the Newberg Volunteer Association essentially to shut-down business for the last two years as vice-president," Nodine said, referring to the city's decision to annex into TVF&R's district and disband the fire department. "We've been trying to leave our mark on the town as much as possible and leave as much traces of our association as possible. This came about and it is a good opportunity to leave behind our mark and legacy. "Capt. (Alex) Haven (at Station 20) made it known to me that (the truck) became available and that it was an option. I contacted Chief Stock and we had a few meetings. We both realized that it was in the best interest to protect this antique for both our sakes for the foreseeable future. TVF&R has the staff to restore the fire truck back to its former glory and a place to store it." The DFD returned the truck to Newberg with the siren blaring for old times' sake as firefighters at Station 20 awaited its arrival. Once the truck rounded the corner, all the firefighters from Newberg stepped outside to both greet the truck and the Dundee firefighters, who were riding along the sides and back as they did in 1936. They parked the truck before the bay at the station, then tradition took over as firefighters and chiefs gathered around the truck and pushed it into the bay. "It is neat to get it back. It not only served in Newberg, but in our neighboring community for the last, almost 100 years," Nodine said. "Imagine how many calls the truck responded to and how many fires it put out." It's destination in Wilsonville stores apparatus from Beaverton, Tualatin, Sherwood and West Linn. It will be well cared for. "It is a part of preserving the history. TVF&R has a group of volunteers that works on the fire trucks; they dedicate a lot of their time to take care of them," Stefan Myers, TVF&R public affairs officer, said. "We are looking forward to getting it restored and getting it back into shape."